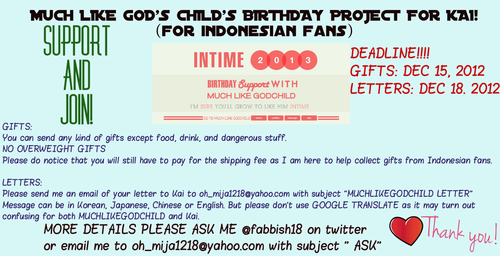 In order to celebrate Kai’s upcoming birthday on January, Kai’s fansite “MUCHLIKEGODCHILD” is having a birthday project! To make the it easier and the EMS fee cheaper, I will help them to gather gifts and letters for Kai from INDONESIAN FANS. Please write in English, Korea or Chinese (No Bahasa). Or if you want to write in Bahasa, make sure that you put the other version. Edit first before you send it to us. Because we won’t approve any letter who has a lot of typo. Do not type something too weird or vulgar. You can write everything about Kai but dont judge him too much. The context is Kai’s Birthday. The maximum page is only 1 page. Please send us in Microsoft Word Form not in body e-mail. Every person who participates in the gifts project MUST pay the EMS fee (Shipping fee) from Indonesia to Korea which will be split up according to how many people join the project and depends on each of your gift’s weight. The EMS fee for 1 kg is approximately 200000 IDR. For example: There are 5 people who join, then 200000 IDR will be split up into 5 BUT the person who give bigger gift will have to pay more than the others who send in smaller gifts. The more people who join, the cheaper EMS fee that you should pay.